I made 1 big loaf and about 5 rolls which I ended up eating in 2 days 😬. I do have to say the rolls were probably some of the best ones I have made to date. The combo of rice, potatoes and sprouted flour made them nice and soft and full of so much flavor. I am going to make another batch of just rolls next time and freeze them for later use so I don't eat all of them right away! 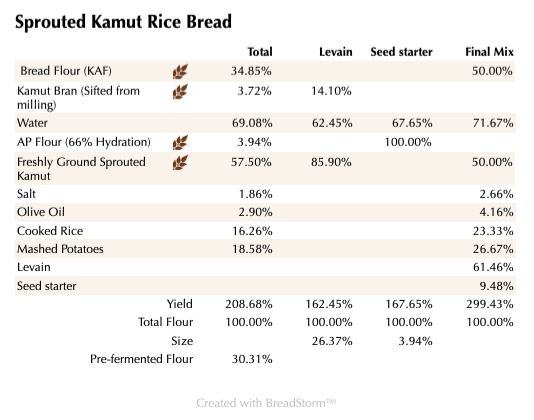 If you don't have Kamut to sprout you can use Durum which would be just as good. I used some Organic Jade Pearl Rice I bought at Whole Foods. The uncooked rice is very unique and looks like little green shards of jade and has a very mellow pleasant taste. If I didn't tell you there was rice in the bread you would never know, but it does help add another layer of flavor and texture. You can certainly use any style of rice you have on hand and it should be just as good. some beautiful looking bread. I bet the taste is just smooth and deliciously savory, with that 'unknown' taste imparted by the kamut. Appreciate your kind words Hester. Glad you like the bake. It was especially 😋. Yes you can use the grains from Breadtopia to sprout. You only want them to sprout slightly so the nub is showing. I have a dehydrator I use to dry them out. You can use a fan to air dry them but yiu have to be careful not to use too high of heat. @Ian: I usually let the grains sprout until the radicle is about the length of the grains themselves. Are you reducing the sprouting time to preserve their gluten content? I found that lightly sprouted flour don't taste as sweet but feel less sticky when used in the dough. They still have that refreshing "sprouted grains taste" though. I've never heard of this variety of rice yet it surely sounds special. 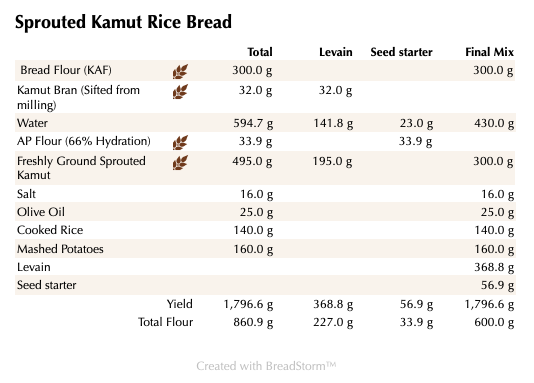 The bread must be really sweet and tasty with the sprouted kamut. And oh, the crumb looks so soft! @Caroline: I bought my grains from Breadtopia as well. 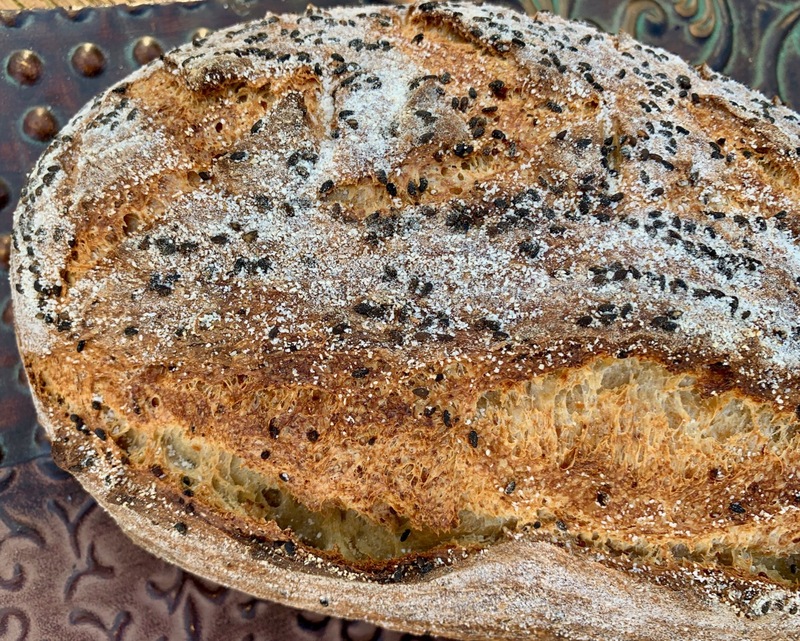 Their kamut, durum, red fife wheat, white wheat and rye sprout well from my experience. However, I have trouble getting their spelt to sprout... I know the questions aren't meant for me but in case you're interested, I always dehydrate my grains for 1-1.5 hours, in the oven at the lowest temperature with the door cracked open. Sometimes, I refrigerate the fully sprouted grains (in a single layer) overnight to suit my schedule. This cuts the dehydrating time further. Unless you are going to add the sprouted grain whole in the dough, there is no reason to let them sprout that much. I don't know if it really changes anything, as I don't recall but I did read about it somewhere. You do have to be careful of the temperature you dry them out at. If it is over 125 degrees Fahrenheit it will turn into malt which you don't want. This rice is great and you would love it I'm sure if you could find it. It will probably be difficult to find in HKG but you never know. I am starting a new job on Monday and will be traveling to Asia at some point this year, so maybe we can meet up and I can bring some to you. 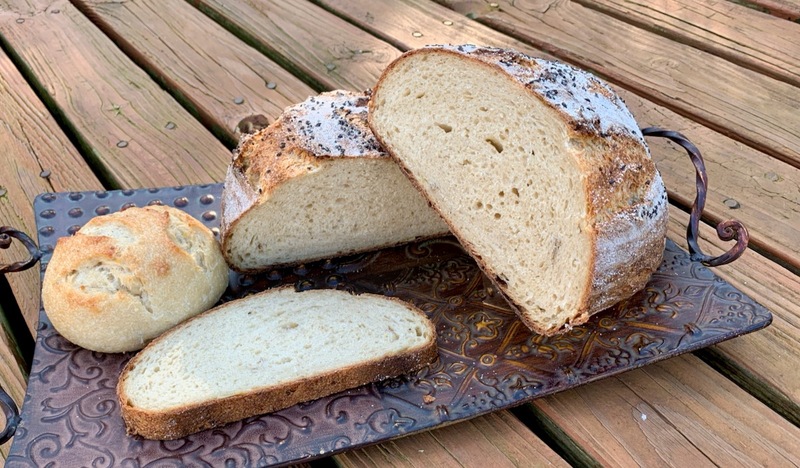 The bread tastes amazing and the smoked sesame seeds I used for the topping puts it over the top. Hope you are going to enjoy it! I believe I learned this from Dabrownman: it's fine to dry sprouted grains in the oven as long as the temperature is kept below 160°F. This is the first time I hear that they turn into malt at temperature over 125°F... Very thought-provoking indeed. You get me thinking: some kinds of sprouted grains do taste malty to me, particularly sprouted spelt. Maybe that's because the malting process has been initiated? I'd love to try the rice but if I've to be totally honest, I look forward to tasting your bread much more :) Smoking makes everything tastier in my opinion. I really should find use the bottle of liquid smoke more often. I hope we can meet soon...I can't wait for it already! DA has written several posts about malting. You may want to do a search and read them. I'm pretty sure I'm right about the temperature but I could be off a bit. I am not sure when I will be traveling for this new job, but will certainly let you know once I have a clue. I would of course bring you a bread 😀. I love smoked anything too! If you can find the smoked sesame seeds or smoke them yourself I think you will love them. They are smoked with bamboo wood according to the bottle. Very strange that you should have a digestive issue with it since I was lead to believe it should actually be easier to digest. What do I know though? Thanks for your comments as always and let me know if you need any help. Yes, it is a big relief to find something. It was a long road which is to be expected especially as you get to be in your 50's. Look forward to hearing about how your sprouted grains go. Interesting article about the sprouted grains. I think if you use a small % in the dough you should be okay hopefully. Wow! I love that loaf! I don’t know what it is but I want a slice of that right now! Bookmarking this one too! Glad you like it. I can't wait to see how your version turns out. If you try it, make a few rolls too. I have to say the rolls were insanely good. Soft and flavorful and perfect. Such a nice bread all the way around! Just looking at the cross section really says it all. It has taste great ans s healthy as all get out. Everything we look for in a fine SD bread. Love the green jade rice. I will have to get some if I ever go back to WF again. I'm still staying away from them for getting rid of all the grains in their bins. At least Lucy spends more time on Amazon now looking to stock her pantry and it is a lot cheaper too - plus Amazon stock is up $135 in 2 days too. Fry's (Kroger in Phoenix) started delivering groceries with autonomous vehicles a couple of months ago here and they only charge $5.95 for a totally impersonal grocery delivery experience - what everyone wants in everything if they think about it:-) It will be forever before WF does anything like that and it will cost a fortune no doubt like everything else there. I guess they call Green Jade Rice Bamboo rice too, The cheapest I can find it delivered on Amazon is $4.75 a pound with prime. That is some expensive rice! We are getting ready for my birthday on Saturday by starting with happy hour wine and burgers on the patio at Zinburger's tomorrow afternoon. It's only going to be 70 F but it will be better than Saturday's 66 F so we are planning on going to Chris Biaco's sandwich place (Pain Banco's) on Saturday for lunch and then move on to his new taco place for dinner - Roland's Cafe Market Bar. He partnered with Tacos Chiwas for Roland's and they have the bet taco place in Phoenix. Roland's might be the best new restaurant in Phoenix opened last year. Then we will have been to all for Chris Bianco's restaurants! Your bread is only getting better Ian. Lucy sends her best to the Frozen East Coast Pack! Happy baking Ian! Glad you like the bread. This one is a keeper for sure. The rice is expensive as you noted. I have not looked for it on Amazon but it's probably the same if not more in whole foods. They still have grains by me in WF but only Red Wheat and sometimes rye if I'm lucky. It's a balmy 17 degrees this afternoon here, and was around 3 degrees this morning. It's still warm compared to parts of the mid-west which have been below 0 even before the windchill. I'm ready for that Groundhog to show his face for an early spring! Max and Lexi and the rest of the gang say hi to Lucy. My Lucy the cat just got back from the Vet after getting shaved. She always gets all matted up when her winter coat comes in and she won't let us brush her, so now she looks like a bobble head kitty! Congratulations on turning out yet another lovely and tantalising loaf -- and double congrats on the new job. I'm very happy for you. Knock 'em dead and keep on baking! I really appreciate your kind words! I'm super excited about starting the new job. It's nice to have a new challenge. Glad you like the bake. I'm just about done eating this loaf and wish I had more left. Guess I need to bake another batch 😀. Looks like I have another combo from you to try. 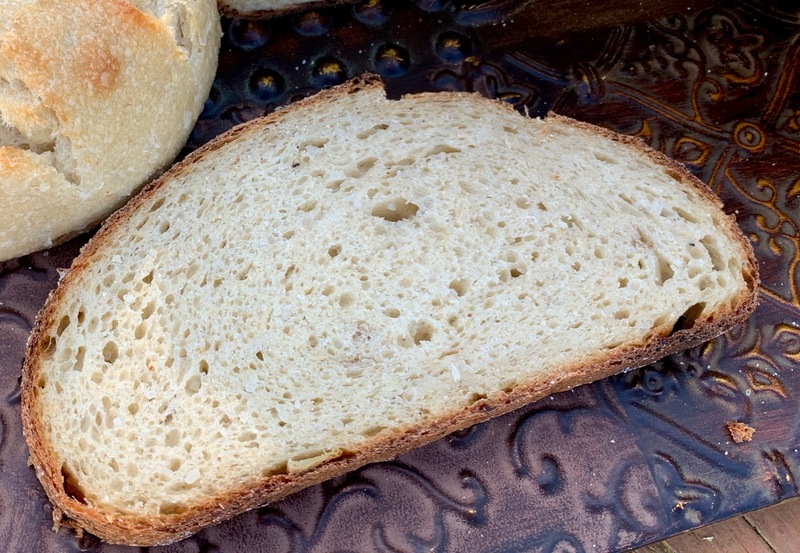 Crumb looks so soft and inviting. Love the photography on this one too. Glad you like it and hope you get a chance to try it.